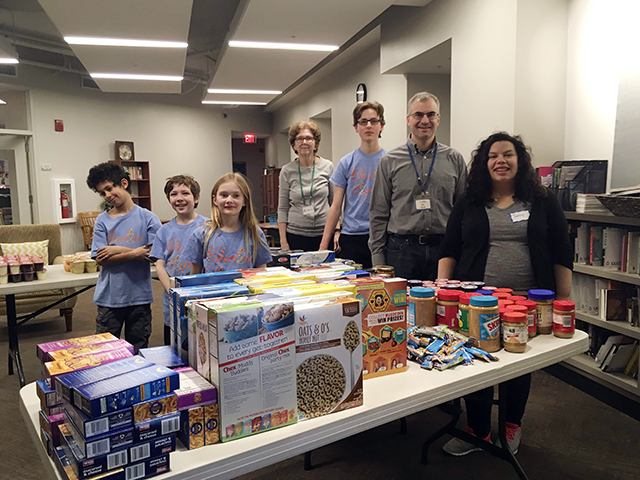 Tackling food insecurity is a serious endeavor at the Unitarian Universalist Congregation of Columbia (UUCC) in Columbia, Maryland. Although the Food Insecurity Committee has been around less than two years, it has had an enormous impact. In that time, UUCC has provided thousands of meals to families in their community. The first project began when No Child Goes Hungry’s founder, Rev. Kären Rasmussen, then assistant minister at UUCC reached out and made the connection to a local elementary school. Kären and a hardy group of volunteers began providing bags of food to the school. The groceries were then distributed on Fridays to students who were receiving free and reduced lunches. The response from the congregation to this program was overwhelming. Cindy attributed this to the immediate impact providing food creates. “We know that it’s going directly from our efforts to feed somebody,” she said. One of the reasons the program at UUCC has been so successful is the ease in which everyone can participate. Several volunteer opportunities each month allow people to give what time they have to help. 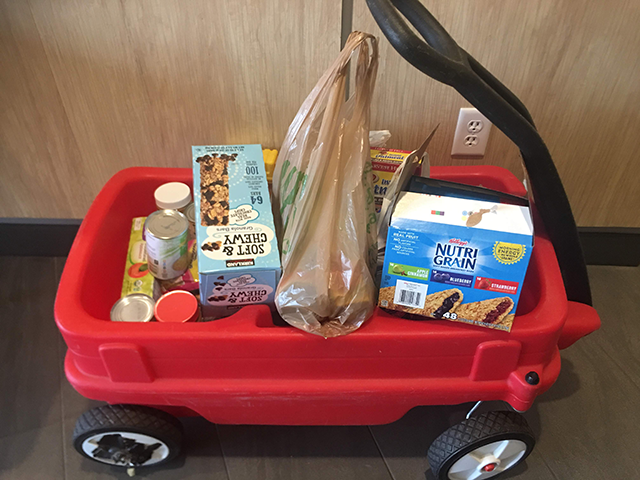 Red wagons placed in the building are an easy location for people to leave food donations. The congregation has an Amazon wishlist so people can place an order that is delivered directly to the church, and at the weekly scriptable, people can buy a grocery gift card and donate it to the Food Insecurity Committee to use. The children of UUCC have also contributed to the success of the program. Once a month children in the Religious Education program pack food heading to the elementary schools. Before they begin, they engage in a discussion about hunger. Robin noted that a program like this is something with which even the littlest ones could help. Currently, UUCC provides a variety of snacks, weekend food program donations, and supplemental food for four different schools in their area. They also provide food for local seniors once a month and have a Little Free Pantry on their property they are refilling twice a day. This summer, through an additional grant from No Child Goes Hungry, UUCC will provide meals to 340 local students in July. We are so happy to continue to support the work of the Unitarian Universalist Congregation of Columbia as they make such an impact in their community to put an end to food insecurity and childhood hunger. Thank you to the many donors that help make programs like this happen! If you’d like to donate to No Child Goes Hungry to help feed more hungry kids, click here!